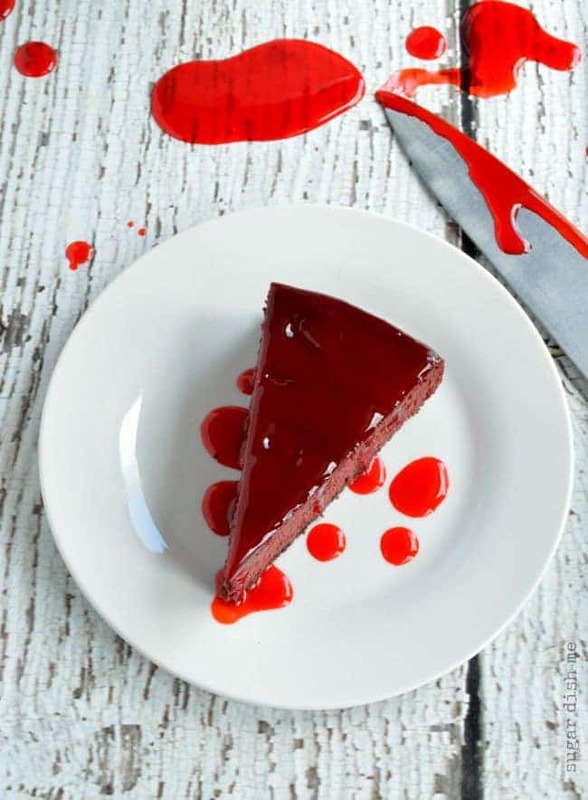 There are a few elements going on here to make this cake all bloody and Halloween-ey. FIRST is the red gel frosting that I made with the help of this Wilton icing color. The second is the base I put the cake on. I used a cardboard cake round like this, but if you don’t have any, I’ll tell you that cutting a 10″ circle from a pizza box and wrapping it in foil totally works. 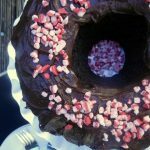 Be sure to make this cake a day ahead so it has the proper time to cool in the oven and then chill in the fridge before serving. Prep time listed includes chilling. 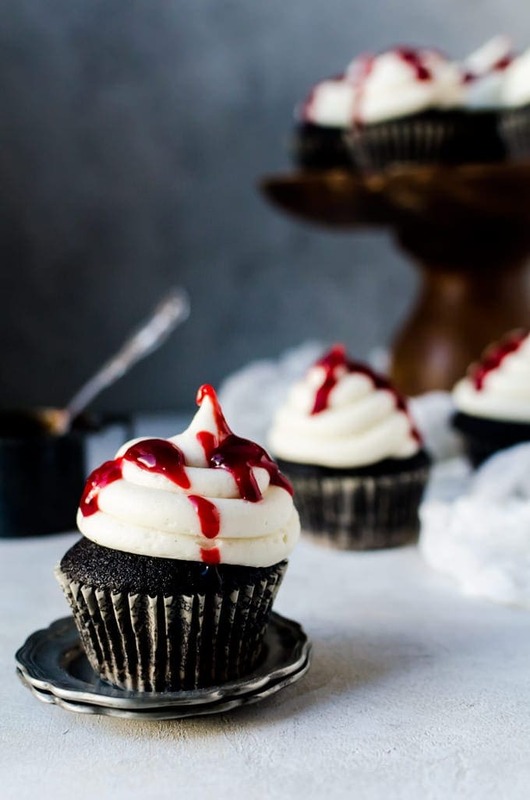 These Black Velvet Cupcakes with Raspberry Jam from Amanda at A Cookie Named Desire. DEEEPLY chocolate cupcakes with cream cheese frosting and raspberry jam. YESSS. 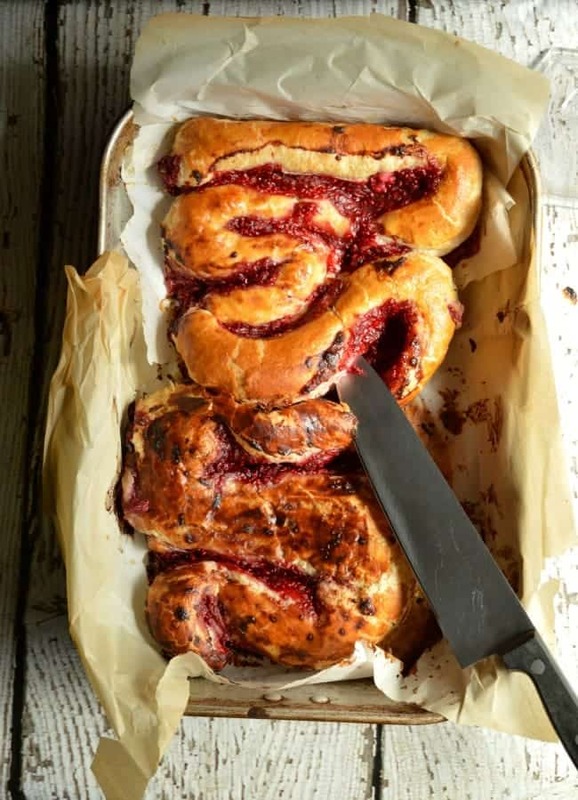 This Icky Intestines Bread looks pretty gross but it’s really just puff pastry is filled with sweet cream cheese and raspberry sauce, rolled up into large and small intestine shapes, and baked for a sweet breakfast or dessert icky good Halloween treat. You’ve pulled a Halloween trifecta!!! 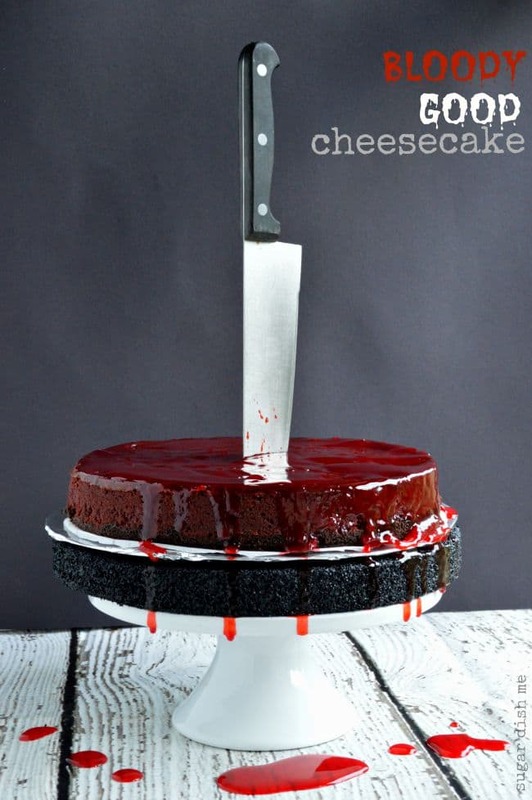 Your cheesecake is creepy, delicious and SO creative! I love how you figured out how to keep the knife upright. You know how to do Halloween right!!! Thank you so much Liz! I’m super excited to see what everyone has come up with, Can’t wait to share your cupcakes on Thursday! Heather! This is “Bloody Fantastic” haha. It would be 100% perfect for a Halloween party/dinner! Love the tips for getting the knife to stand up! Thanks Angie! I had lots of fun with this. Can’t wait to see your recipe! This is brilliant. 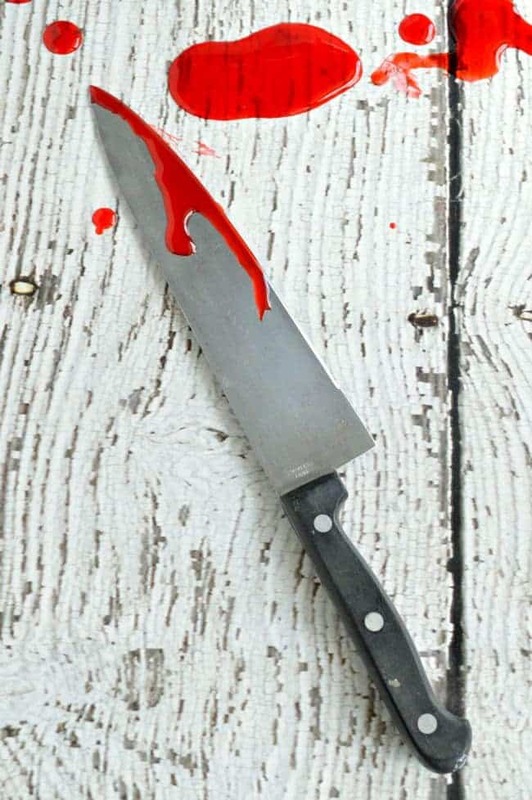 I love the REAL kitchen knife as opposed to a prop one. I’m so excited to make this for my Halloween dinner party! 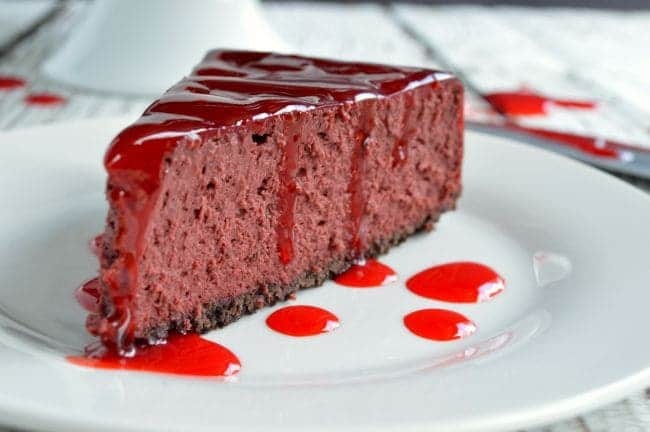 This might be a silly question but is there any reason that regular red food coloring wouldn’t work with the gel icing? I would rather avoid buying something I won’t use often. Thank you! Hi Denae! 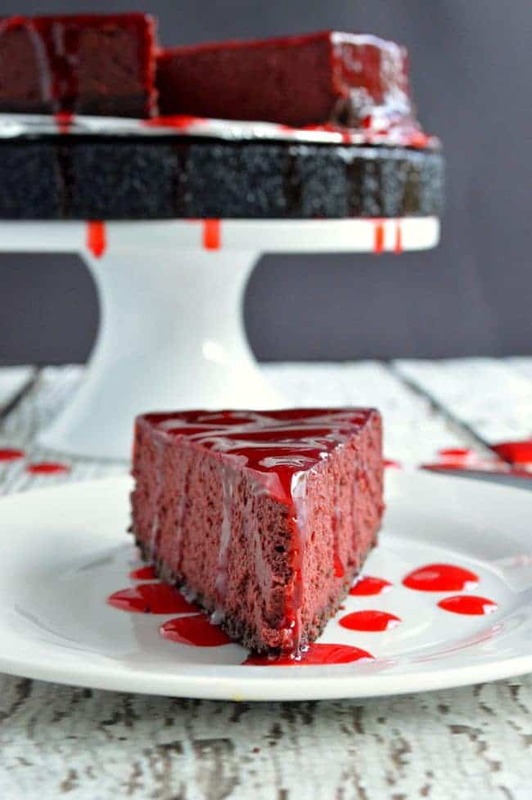 You can absolutely use red food coloring but! Your gel frosting may not be as thick. The Wilton Icing color is super cheap (you can get it at Walmart either in the baking aisle or the craft aisle; it’s only a dollar or two). 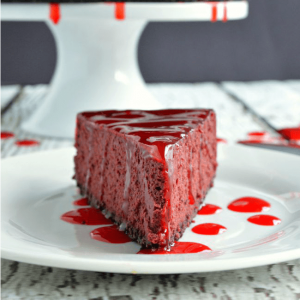 The Wilton Icing color is more concentrated and is a TRUE red, even if you just add a dab. With food coloring you know if you just add a little then it’s pink and you have to add more to get a true red color. 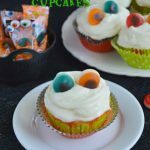 The icing color also has a thick consistency instead of a liquid like food coloring. So those are my reasons for using it, but all of that said I am always an advocate of using what you have on hand. If I can get out of an extra shopping trip or just want to use up some things then that’s the direction I always go! Hope that helps! Hi! This cake looks absolutely amazing! Would you be able to substitute something else instead of the corn syrup? Nope. The corn syrup is pretty crucial to get the texture of the gel frosting right. Sometimes when people have a problem with corn syrup (Karo syrup is the common brand name) they are confusing it with high fructose corn syrup. They are not the same thing. High fructose corn syrup is a food additive. 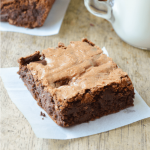 Corn syrup adds glossiness to frostings and is used in baking. You write that the eggs have to be at “rook temperature” – does it have to be rook, or could it be some other type of crow, such as jackdaw or even magpie? Haha, I’m kidding, I know it was a typo. Serious question: would another syrup do, instead of corn syrup (i.e. a syrup of equal thickness/runniness)? Some of these ingredients aren’t always readily available in Europe. Ha! Thanks for catching the typo. NOTED. Thanks for the answer and your tip. I have agave syrup and that is the first thing on the list of substitutes. Thanks for this delicious recipe–I made three 4″ cheesecakes and had some left over, which I poured into a small foil load pan. It was tasty yesterday but PERFECT this morning. It definitely needs that day to chill. Also, if you’re using liquid food coloring, make sure you have a full bottle on hand–I ran out and now my cake is a bit more chocolate-colored than “red velvet.” Still, it’s delicious. As for the blood, make sure you have that cornstarch completely dissolved before you cook, or you’ll have lumps–blurgh. I added all the rest of my liquid food coloring and one single drop of blue, just to give it a bit of depth. With 4 tsp. cornstarch, it didn’t drip down the sides for me, but that’s OK, because I’m using a recipe I found for sugar glass and adding some blood-dipped glass to the cakes for a garnish. For presentation, I found an old silver-plated candelabra I don’t use, glued three foil-covered cardboard circles to the candle holders, and ow I have a perfect little cake presentation plate for three tiny cheesecakes. Can’t wait to get to the party! Thanks for all the Tips Holly! Hope your Halloween was excellent! Muhahahaha This is still one of my favorite Halloween cheesecakes! Hi! Wow! I love the Idea!!!! Can I put the cake with the thicker blood gel on top in the freezer for a week? And how long on advance can I make the lighter blood gel ? Do I keep it at room themperature? Hey Christine — I’m sorry this didn’t work for you. I bake Cheesecake ALL. THE. TIME. The low and slow method has literally never failed me and water baths are super annoying. Check your oven temp and — if it doesn’t look done it probably isn’t. I always check and then keep it in longer if I feel unsure. Christine your comment made me worried that I’d missed something here and so I made 3 cheesecakes in 3 days, following my own instructions EXACTLY. The cheesecake was done every time. In fact in 2 instances it cracked which lets me know it’s not just done but TOO done. So I am addressing that in a new cheesecake post coming soon. If you followed the recipe “to a t” then your cheesecake should have been done. I’m sorry you had trouble with this, but I also make A LOT of cheesecake and with this particular ingredient list/set of instructions, “completely raw” or even just slightly undercooked is not an issue. Holy cow! 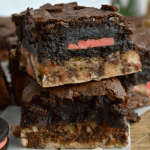 I pinned this recipe and went back to review it today as I’m baking it tonight for the big day tomorrow – as I was reading the recipe I noted you the author – blast from the past – Heather Tullos who used to live up the street from me Eleanor Hains Rodway. Of all the random things I pinned on Pinterest. Cheers to you and your blog all your recipes look fab and I cannot wait to try this cheesecake. Happy Halloween! I am new to making cheesecakes. Do you flip the cheesecake over to get the parchment paper off? Or what method do you use? 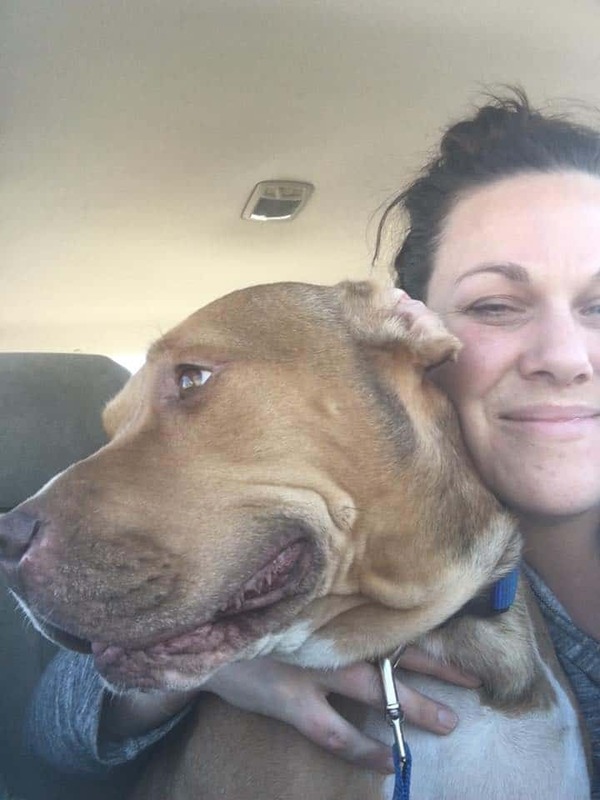 Hi Vanessa! Cheesecake is totally good 3-4 days ahead as long as it’s wrapped and refrigerated. I’d make the glaze the same day. I made this recipe today and I have a temperature gage in my oven so temp was 325 for 20 minutes and then reduced to 225 for 30 minutes, then let it sit in my oven until room temperature. I did exactly as instructed and I was also concerned about the recipe temperature and cooking time. I mean there are 4 eggs in there. Sure enough I let it cool and then as per the instruction taking the springform ring off and wanted to move to a cardboard like instructed it fell apart. The center was like pudding. So I now believe longer cooking time and so no water bath should be clearly stated as most recipes address that and so I had the parchment paper on the bottom and foil on the outside bottom and I was unsure so I used water bath. Anyway, that didnt work either….I am willing to try again…but its not cheap to dump this kind of dessert. It was for a Halloween party tonight. Thank God I made something else as well. Hey Linda — if you needed a water bath I definitely would have stated that. I would never expect a reader to intuit something like that because many of my readers are first time cooks or bakers. I’ve never had this method fail me! Will leaving the cheesecake in the oven until it gets to room temp overcook it?